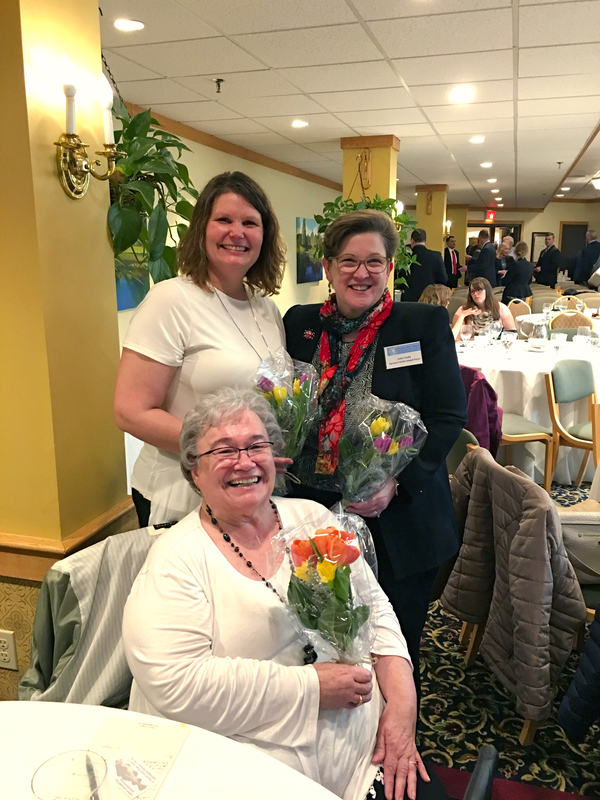 At the Annual Vermont Center for Crime Victim Services award ceremony, Chittenden County Safe Driver victim impact panelists Donna Zabrosky, Linda Crosby, and Liz Miller were presented with this year’s Survivor Activist Award. The Survivor/Activist Award is for a victim of crime who has taken his or her own personal experience and translated it into action or advocacy on behalf of other victims of crime. Each year, their contributions to Chittenden County’s Safe Driving Program impact hundreds of Vermonters in the classes and motivate participants to keep our roads safer. Safe Driving is a statewide program offered through a partnership between the Governor’s Highway Safety Program, Community Justice Network of Vermont, and local Community Justice Centers. The program serves as an education program for Vermonters charged or convicted of unsafe driving offenses such as DUI, texting while driving, excessive speeding, or reckless endangerment. In Chittenden County, we offer the program 1-2 times a month with 35 people registered for each two-day session. The program incorporates a number of learning exercises, but as many of us know activities, homework and reflection only do so much to create motivation to change. Thankfully, our program has the support of Donna, Linda, and Liz and together they offer what is often referred to by participants as the most meaningful and motivating piece of the program – their stories. Month after month, Liz, Linda and Donna bring courage and strength to the program by sharing their stories of loss and grief. They provide powerful faces to the realities of unsafe driving decisions. Their words humanize the ripple effects that we can create when we drive. Their voices remind us that we are not alone on the road – there are neighbors, families, friends, and loved ones on the road that have the right to get home safely. Donna and Linda have each been speaking for over 13 years. This means thousands of Vermonters have received the gift of their stories. Their dedication inspires others to share their story and that is one of the reasons Liz has now joined the team. When one person shares, it creates space for others to find their voice. They have shared insight to other Safe Driving sites for recruiting speakers, mentoring new speakers, and ideas for supporting speakers. And their efforts continue past Safe Driving with many presentations to schools during prom season and Vermont’s Annual Red Ribbon Tree ceremony honoring those lost by impaired drivers. Thank you Donna, Linda and Liz!